Applications are invited online from qualified candidates through the proforma application to be made available on commissions website for the Notification pertaining to the various posts in the following departments in the state of Telangana. The candidates are advised to visit the commissions website for detailed information. The submission of online application is from 16-11-2017 and last date for submission of application is 08-01-2017.
please visit www.tspsc.gov.in. No further objections will be entertained on Final keys. TSPSC has conducted written examination for the staff nurse posts recruitment on 11-03-2018. The preliminary answer keys of the staff nurse posts recruitment exams will be available on tspsc website from March 16. The objections on the preliminary answer keys will be acccepted through online mode only on tspsc website from March 20 to 26. Candidates are advised tonote the above date and submit their objections through the link provided. 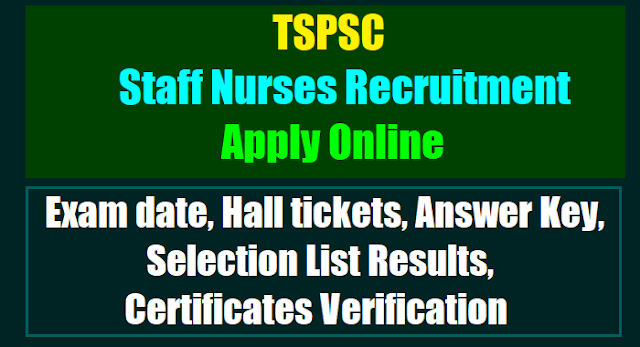 TSPSC Staff Nurses Recruitment Hall tickets 2018: Hallticket Download for Notification No 57/2017 Staff Nurse in Director of Public Health & Family Welfare and Telangana Vaidya Vidhana Parishad (Health, Medical& Family Welfare Department) . TSPSC Staff Nurses Recruitment Hall tickets download from TSPSC Web portal. Exam date of Staff nurse posts 2018: 11-03-2018. TSPSC Staff Nurse Recruitment 2017; Online Application Process To Begin From November 16: Telangana State Public Service Commission (TSPSC), Hyderabad on a notification dated November 8, 2017 announced recruitment of 1196+835=2031 staff nurse recruitment in Directorore of Public Health & Family Welfare and Telangana Vaidya Vidhana Parishad of Health, Medical & Family Welfare Department of Telangana Government. The online application process for these staff nurses posts will begin from November 16 and the last date for application is December 11. The registration and application process can be done at the official website of TSPSC. The recruitment exam can be held either as Computer Based Test or as Off line OMR based examination of objective type. How to applyfor TSPSC Staff Nurse Recruitment 2017: Before applying for the posts, candidates shall register themselves as per the One Time Registration (OTR) through the Official Website of TSPSC. Those who have registered in OTR already, shall apply by login to their profile using their TSPSC ID and Date of Birth as provided in OTR. Eligible candidates may apply through online mode only. candidates are advised to visit commission website: tspsc.gov.in. After the registration, the candidates may login to the TSPSC website and complete the application process. TSPSC Staff Nurses 2017 Recruitment, Hall tickets: Hall tickets can be downloaded 7 days before commencement of Examination. The Telangana State Public Service Commission (TSPSC) has issued notification for recruitment of 1261 various posts in Health Medical & Family Welfare Department, Insurance Medical Service and Telangana Social Welfare Residential Degree Colleges (TSWRDC) Women. Of the total posts, 1196 are of staff nurse in Directorate of Public Health and Family Welfare (DPH&FW), Telangana Vaidya Vidhana Parishad (TVVP), 35 radiographers in DPH&FW, 21 Health Supervisors in TSWRDC (Women), six physiotherapists in TVVP, two Paramedical Opthalmic Officers in DPH&FW and one refractionist in Insurance Medical Service. The TSPSC in a release on 08-11-2017 advised candidates to visit its website www.tspsc.gov.in for detailed information. Submission of online application will begin from November 16 and last date to apply is 08-01-2018. 3. Hall Tickets can be downloaded: 07 days before commencement of Examination. 4. The Examination is likely to be held: in the month of March 2018. The Examination is likely to be held in the month of March 2018(Dt.11-03-2018). The Commission reserves the right to conduct the Examination either COMPUTER BASED RECRUITMENT TEST (CBRT) or OFFLINE OMR based Examination of objective type.